Now imagine a yoga studio that explicitly welcomes people of all sizes, colors, and backgrounds, one that works hard to offer classes at an accessible price, and is meant for people to enjoy their bodies and explore their diverse abilities in a safe space. This studio in East LA offers classes like Radical Self Care, Yoga en Asiento (Seated Yoga), or Yoga Seeds, a class for parents and children. Classes are “inclusive and accommodating,” focusing on self-care and empowerment – not athleticism or strict adherence to form. 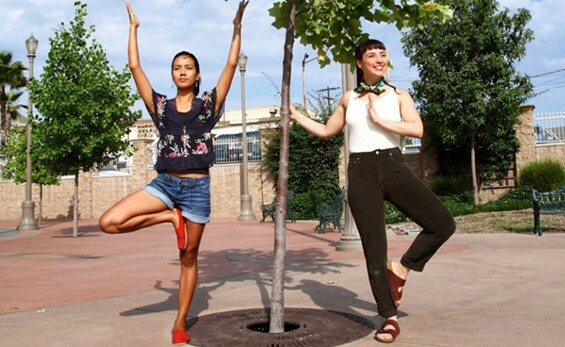 People’s Yoga was founded almost two years ago by Leah Gallegos and Lauren Quan-Madrid, who traveled throughout Los Angeles offering donation-based mobile yoga classes in schools, community centers, and churches. The point was to make it accessible to communities who are not often found “on the mat.” Today, they run one of the only yoga studios to serve residents of East Los Angeles, most of whom are of color and low-income. 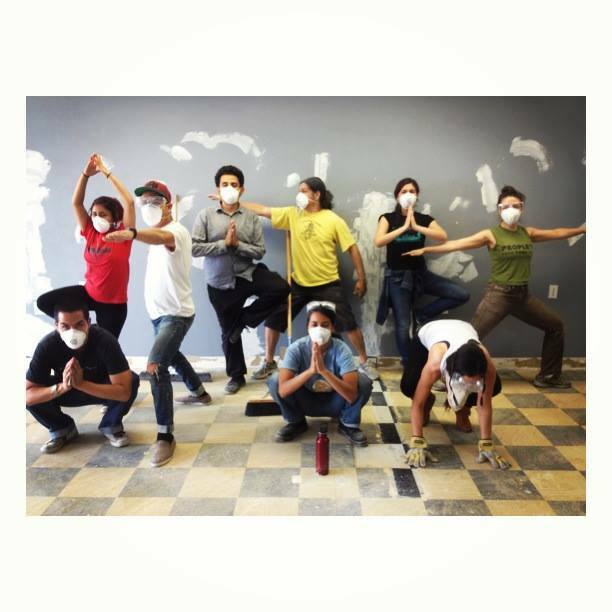 Las Cafeteras helped prepare the new studio for opening day. One of the studio’s founders, Leah Gallegos, is also part of the popular musical group Las Cafeteras, which describes itself as a band “who is looking for love and fights for justice in the concrete jungle of Los Angeles” by playing Afro-Mexican influenced music. They are perhaps best known for their political take on the old classic “La Bamba,” re-titled “La Bamba Rebelde,” and have also spoken out against deportations and in support of vegetarianism. The band even purposefully left their name as Las Cafeteras (as opposed to los) to challenge masculinity as the default in the Spanish language. Someday, I will take a trip down to LA and take a class at People’s Yoga. Afterwards, I’ll write an article titled “It Happened To Me: I Took a Yoga Class and Left Feeling Empowered and Ready for the Revolution.” I hope it goes viral. Juliana‘s favorite yoga position is Warrior Pose. Hispanic Heritage Month is complicated for me, to say the least. From September 15 to October 15, we are told it is socially and politically acceptable to host festivals and fiestas in honor of our culture. For thirty days, we are encouraged to show national and ethnic pride; for the rest of the year, we are asked (not so politely) to erase our accents and hide our homelands.